The development of cold chain systems is a force multiplier that can generate exports and open new markets over multiple sectors over an extended period, rather than a one-off export transaction that can be quantified simply as an export success. 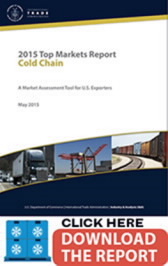 U.S. businesses understand the need for viable and efficient cold chain systems; they spend hundreds of millions of dollars each year to build and maintain cold storage and transportation systems which allow U.S. businesses to flourish. Export promotion and trade policy agencies should focus on the development of international cold chains by working to develop an effective international regulatory environment, increase skill level of workforce, and encourage infrastructure investment, thereby promoting the benefits of U.S. services. John Miller and Bruce Harsh served as lead authors of this report. A special note of thanks to David Long for his contribution and thoughtful commentary. Thank you to all cold chain industry representatives who have provide insight including: The Global Cold Chain Alliance, FedEx, UPS and the American Society of Transportation and Logistics.